Identify key features for our messaging products. Explain how customers can use each product. In this module we walk you through what makes up Marketing Cloud. If you haven’t already gone through the Marketing Cloud Basics module, we recommend you start with that. This module assumes that you have a basic understanding of what Marketing Cloud does. Marketing cloud is a single platform made up of several products that fall under three primary buckets: messaging, advertising and data, and social media management. Each product, and various combinations of them, help meet a specific digital marketing need. Before we look at the details of each, let’s first look at the general difference between them. Marketing Cloud messaging products include Email Studio, Mobile Studio, and Journey Builder. These products help you create, build, deploy, and manage communication across different marketing channels at scale, which help map the ways you communicate with your customers. Marketing Cloud advertising and data products include Advertising Studio, Salesforce DMP, and Salesforce Data Studio. These solutions help you create custom audiences and combine data from any source to deliver more targeted marketing. Our Marketing Cloud social media management product is Social Studio. Social Studio lets you listen to conversations; engage across marketing, sales, and service; and publish information for key discussions your customers are having about your brand. In this first unit we go in-depth on Marketing Cloud Messaging products. Let’s take a look at the power of our Marketing Cloud Messaging tools. No one likes getting generic email that doesn’t relate to them. Use Email Studio to send personalized email marketing at scale. So whether you’re a small business sending out emails to a few hundred customers at a time, or you’re a large business sending emails to a few million customers, Email Studio can meet your needs. You can segment, automate, and target your customers based on the data you collect from them. Then, track every email send and open rate, so you know exactly how your emails are performing. Use drag-and-drop audience segmentation tools. Scale and automate all interactions with your customers. Create dynamic email content with drag-and-drop tools. Use case number one: Create and send a “happy birthday” email to your subscribers when it’s their birthday with a celebratory 20% off coupon. Use case number two: Use Email Studio for mass communications to your employees about an event or organizational change. Everyone loves getting SMS and push messages that are immediately useful. With Mobile Studio, you can reach customers at the right time, with the right message, regardless of location. You can increase your immediate customer’s engagement by sending SMS, MMS, and push messaging based on events, location, and proximity. You can use mobile APIs to create and automate custom messages, such as daily appointment alerts, order confirmations, and travel updates. Integrate your CRM data and marketing analytics with your mobile campaigns to have real-time interactions with your customers. Track and send text messages with SMS. Have two-way mobile conversations that include pictures, videos, and audio with MMS, and group messaging. Increase use of your app with push messaging. Use automated geofencing (interactions based on your customer’s GPS location). Track when customers open your app, how much time they spend interacting with it, and details about their location. Create and automate custom solutions with mobile APIs. Use ready-made SMS and MMS templates and drag-and-drop tools to customize your messages. Use case number one: Send your customers mobile tickets and coupons to complete customer services updates and surveys. Keep your customers engaged with your brand and drive customer loyalty. Use case number two: Connect the physical world with the digital world, and when a customer walks into one of your physical stores, send them a push message with the latest deals. This helps you engage with your customers right when they’re ready to take the kind of action you’re trying to drive. Imagine air travel without the air traffic control tower—chaos, there would be many frustrated travelers, and most likely collisions. Not a pretty sight. That’s what it can feel like without a connected marketing platform. 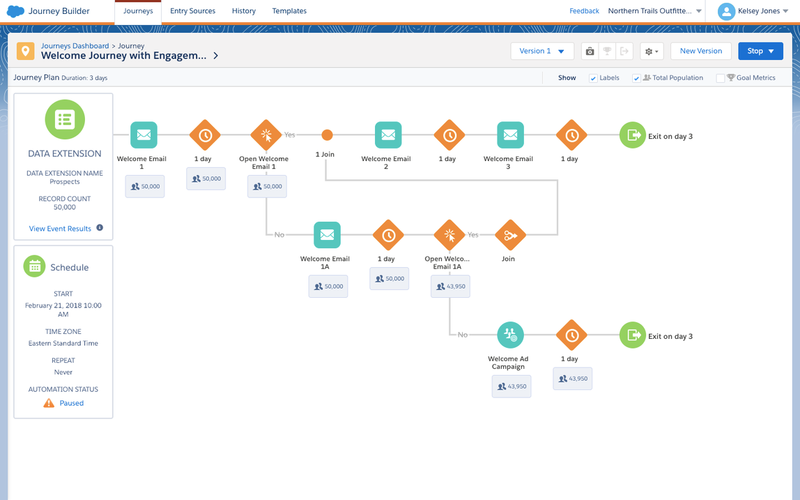 Journey Builder helps you create a coordinated customer journey at scale across email, mobile, and advertising, and triggers based on customer behavior, preferences, or other data points. 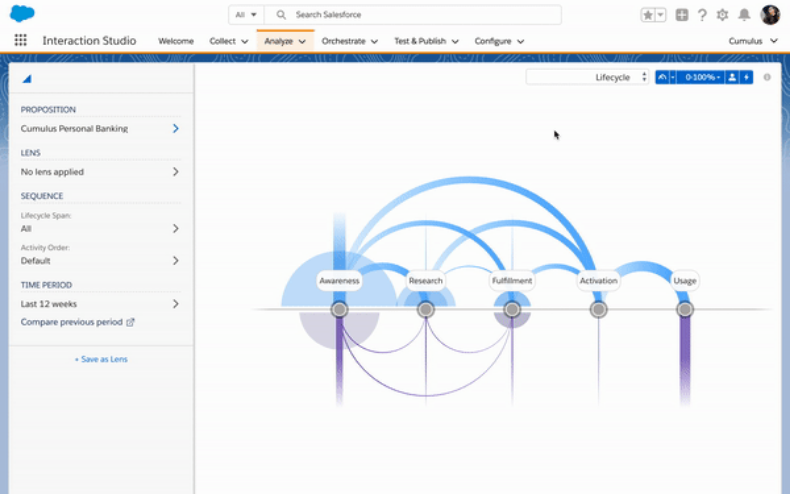 You can customize journeys to respond to customer purchases, clicks, or email opens, and define the path that the customer takes based on their current and predicted behavior. Map the customer journey, and adjust the customer’s path based on their behavior. Build and automate customer journeys across email, mobile, your website, and advertising. Use data from any source. Test multiple variations of content, channel, timing, and frequency. You use Journey Builder to build a customer’s journey for your loyalty program marketing campaign. Using the drag-and-drop tools in Journey Builder, you create the flow of how and when emails and push notifications are sent to your subscribers. You add a decision split into the journey when the customer joins the loyalty program so it sends the new loyalty member a coupon. If the customer doesn’t join the loyalty program in the time frame you define, then a reminder email is sent to reengage the customer.